Read below for the latest update on events and news at Scotland's Towns Partnership. With just five weeks to go to our annual Scotland's Towns Conference, don't miss the chance to reserve your place at the nation's biggest gathering of town stakeholders and advocates! You can also sign up for our newsletter here, and please don't hesitate to contact us if you have any queries, or would like to become a member. Booking is now open for Scotland's Towns Conference 2017. Hosted this year in the lovely Paisley, don't miss out on the year's biggest gathering for all those who work to improve Scotland's towns, communities and city-districts! > Leading speakers on place-making, towns and heritage, including Rob St Mary (Director of Outreach, Patronicity, Detroit), Kevin Stewart MSP (Minister for Local Government and Housing, Scottish Government), Sandra Black (Chief Executive, Renfrewshire Council & Board Member, Paisley 2021), Riddell Graham (Director of Partnerships, VisitScotland) and many more. > Guided walking tour of Paisley’s strategic activity areas. > 'Back to the Future' town centre innovation labs; "Tourism in our Towns" and "Digital Future Proofing". > Networking, marketplace and cultural performances. > Competition exhibitions: Most Beautiful High Street winner announcement, and FutureTown Design Competition exhibition and voting. Read more and book. Join John Scott MSP and Scotland's Towns Partnership to celebrate Small and Rural Towns at the Cross Party Group for Towns and Town Centre's evening reception at the Scottish Parliament. Read more and register. Given the importance of towns to MSPs and their constituents, this is a significant event to connect and inform. Through speeches from the Minister for Housing and Local Government, and leaders in the towns’ field, get up to speed on towns becoming viable, vibrant, vital places. The event will also discuss the upcoming Scotland’s Towns Week (November 20-26). Kindly supported by ABB and Abellio Scotland. 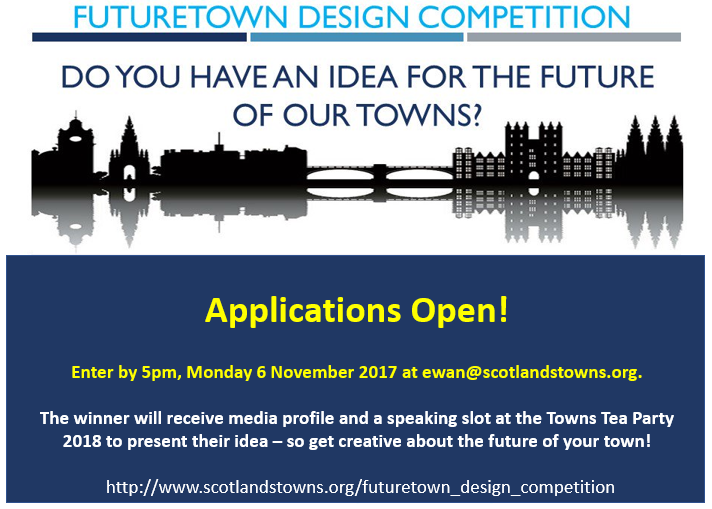 STP invites you to take part in the third annual FutureTown Design Competition to gain media profile for your town and a keynote slot to present your idea at the annual Towns Tea Party! The Scotsman newspaper is our media partner once again for the competition. Shortlisted entries will also be displayed in a showcase exhibition at Scotland’s Towns Conference on 21 November, which will be attended by the Minister for Local Government and Housing, and town stakeholders from across sectors and communities. The deadline for entries is 5pm on Monday 6 November. Scotland's Towns Partnership will shortlist entries, and then the winner will be decided by a public vote held during Scotland's Towns Week, 20 - 26 November 2017. Applications can be sent to : ewan@scotlandstowns.org. Therefore we ask you to get creative and sketch or photograph, image or written idea for a space in your town centre - this can be innovative and creative yet practical and should look to provide genuine potential for development within your town. Whether a unique bin design, building redevelopment, cultural initiative, transport feature, or a new use for existing public or vacant space…feel free to think outside of the box! We are delighted to announce that Scotland's Towns Week will run from 20 - 26 November, with Scotland's Towns Conference taking place on Tuesday 21 November. Host an event; display our ‘shop local’ poster, and more! Read more here. → Let us know about any events or initiatives happening in your town during 20 - 26 November, for display on our events page. → Join the conversation on Twitter using #LoveMyTown @ScotTownsWeek and @ScotlandsTowns.